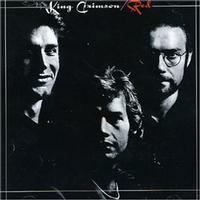 For me Red has always been King Crimson’s ultimate album. I know, there are those who will point to Larks’ Tongues…, but personally I think this one is more cohesive and to the point. That works better for me as I’m not as much into freeform music. So, it was with a great deal of excitement that I got this newly released version. It certainly sounds better than the original and considering how good that one sounded, that says quite a lot. There are some added tracks and, while sometimes such things detract from a disc, I think they really work well. We also get a bonus DVD with various audio versions of the disc and several killer video performances. All in all, this is an excellent set and a “must have” for all King Crimson fans. I’d recommend it for any fans of prog rock in general, though. Since I’ve already reviewed the core tracks in my review of the original disc, those reviews have been reprinted (with a little modification in the case of “Starless”) here for the sake of consistency. Thundering in with an opening theme based on power and mild chaos. The cut changes gear to a new hard-edged jam. The band work through various reworkings of the theme before a transforming mode moves it into the next segment, a more moody and contemplative one. Weird hard edged ambient overtones start this, making it feel like it is about to explode into hard edged musical fury. Instead, the song comes in as a gentle Wetton era KC ballad. This one is still rather quirky and intriguing, but quite accessible. It's a great breather and does include a harder edged jam of a chorus. Slightly off kilter, this one is more KC hard-edged prog fury. This one starts with ambient sedate strings. The cut moves forward in near classical modes for quite a time, but also move into the vein of near chaotic weirdness. Eventually, the weird tones take control, the song moving into near cacophony in its seemingly random wanderings. This is one of those KC instrumental jams that seem a bit hard to figure out or rationalize. From the weird to the purely sublime, this cut is arguably the best KC has ever done, and I really think it might be one of the most perfect examples of what progressive rock should be. Mellow, heavily synthesized tones begin it in a haunting ballad style, and the instruments paint an enchanting melody to make up the introduction. This segment becomes the verse mode of the piece, gradually growing and expanding, the band reworking the central melody, creating a wonderful musical tapestry from it, sax wailing wonderfully overtop for much of the piece. Eventually it moves into an expressive instrumental reinterpretation of the central melodic themes before returning to the verse. After a time, the cut shifts a wandering sort of melodic, while quite exploratory jam. The band work this way through this exploration for quite some time before moving into a fast paced new jam. This moves the cut back to an instrument melodic section, this time reworked into amore powerful version. The conclusion is so completely satisfying that I have always thought that the first few seconds of silence after the cut are actually part of the song. It seems to me that there is agreement on this because the gap between songs here seems longer than it might otherwise have been. The first of three bonus tracks to show up, this is a trio version of the title opening cut. Some parts of this feel a bit lacking in terms of missing layers of additional sound, and yet, it still maintains all the raw energy and power. Keep in mind that, from the personnel listing in the liner notes, Crimson was, at the time, a trio of Robert Fripp, Bill Bruford and John Wetton. There are other musicians filling out roles on the album (most notably David Cross on violin) but really King Crimson at the time was these three guys. For that reason, perhaps this is more purely “King Crimson” than the rendition that showed up originally. The song is a bit starker at times and in some ways that is a good thing. There are also a few sections that feel a little different in terms of the progression. This almost has a heavy metal element to it, but I suppose you could think of it as a power trio arrangement, as well. Whatever you call it, the track works well like this and could have made the original album as it is presented here. Here is the trio rendition of “Fallen Angel,” but, as the title suggests, they present this as an instrumental here. Personally I miss the vocals, but that’s probably because I’ve gotten so used to them being here. In some ways you can really hear the music better and there some to be additional parts and nuances added to the mix on this. I still love this track, vocals or no and other instrumentation included or not. This comes in almost a full two minutes longer than the version that appeared on the album originally. The majority of that is in the violin dominated, classically tinged, extended introduction.